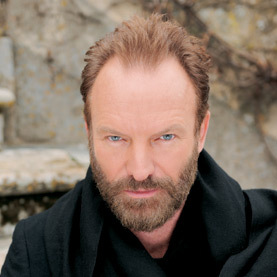 Sting to headline anniversary concert, performing a collection of greatest hits from the Police and his solo career. Tenor Sensation Juan Diego Flórez to perform classical masterpieces under the baton of Rafael Frühbeck de Burgos. Anniversary Ball follows at the Park Hyatt Philadelphia at the Bellevue. As the headline attraction of the spectacular Academy of Music 153rd Anniversary Concert on Saturday, January 30, 2010, in performance with The Philadelphia Orchestra and his own quartet of musicians conducted by David Hartley, Sting will perform in Philadelphia with an abundance of fresh critical and popular acclaim. Watching his album become a classical crossover sensation since debuting at #1 on Billboard's Classical and Seasonal charts at the start of the holiday season, the Academy is especially proud to welcome Sting with such comfortable surroundings unique to the intermingling genres that have defined his remarkable career for nearly four decades. "The Academy is thrilled to be hosting Sting," said Philadelphia Academy of Music President Joanna McNeil Lewis. "As he continues to explore musical genres including the world of classical music, the Academy of Music 153rd Anniversary Concert and Ball is an opportune time to see Sting perform live with one of the best orchestras in the world." The first half of the program will showcase Rafael Frühbeck de Burgos, chief conductor and artistic director of the Dresden Philharmonic, leading The Philadelphia Orchestra in a program of masterpieces featuring guest tenor Juan Diego Flórez, a thrilling performer famous for his high C's. In 2008, Flórez became the first soloist to perform an encore at the Metropolitan Opera since Luciano Pavarotti in 1994. In February, Flórez will reprise his headline-grabbing Metropolitan Opera performance as Tonio in La Fille du Régiment. Sting will be backed by the Orchestra and a versatile quartet comprised of Dominic Miller on guitar, David Sancious on piano, Vinnie Colaiuta on drums, and Christian McBride on bass, performing notable songs from the Police repertoire and his solo career, in original orchestrations. Sting first became interested in classical music while it permeated his home as a child and has always carried that music with him throughout his enduring career. "I grew up listening to classical music, and remember being under the piano while my mother played Beethoven sonatas in our house," says Sting. "I always strive to challenge myself, and music allows me to constantly learn new things." For complete information on the artists and this event, please click here. This concert will be performed without an intermission. Members of The Philadelphia Orchestra are graciously donating their services for this concert in support of the Musicians' Pension Fund. Gala tickets are available. For information, please call the Academy of Music Restoration Fund Office at 215.893.1940. Concert-only tickets are available in the Academy of Music's Amphitheatre for $200. Please call 215.893.1999 or visit www.philorch.org/academyofmusic.